It starts on page 23 of the 33⅓ book, Live At The Apollo by Douglas Wolk. The historic arguably epic James Brown album was ostensibly recorded the night of October 24th, 1962. But in reality it is definitely edited, and probably contains takes form different shows that week. Brown rented the venue for the week for the purpose of recording the live record. This stretched from Friday October 19th through Thursday October 25th in 1962. Thursday October 18th was spent rehearsing in New York. They played 4 to 5 shows per day that week. So When a little-known DJ pops up in the story, you know it's arcane. 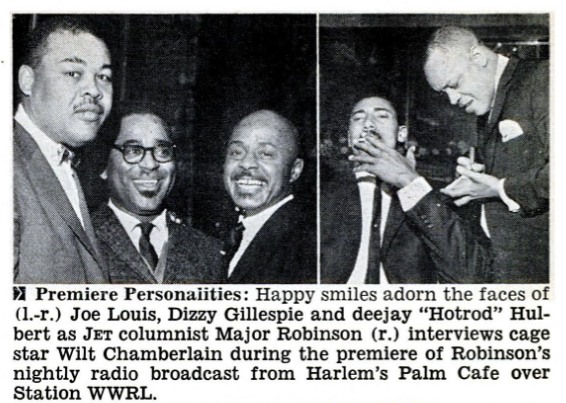 "Traditionally, the the outgoing and incoming shows would have a Thursday-night "wrap-party" at the Palm Cafe, a bar and restaurant down the street from the Apollo; between Midnight and 3 AM, Major Robinson would broadcast over WWRL from the Palm, although the 18th was his final night there." So there was a live broadcast at the Palm the night of their rehearsal. Major Joseph Robinson was there on the 18th, but not the 25th. The question becomes.. did James Brown appear on WWRL-AM that night? It seems unlikely, the man did coin the phrase "kill 'em and leave." But Major Robinson remains an interesting radio personality. The caption on the image is from February of 1962, and Interestingly The North Carolina Times called Robinson a "Nationally known columnist" in March of 1962. Notice that he stands taking notes beside WWIN disc jockey Maurice "Hotrod" Hulbert. Clearly, Hotrod is the news, Robinson reports it. So notwithstanding that national renown, Robinson's radio show ran nightly from midnight to 3 AM, so this is more of a "night mayor" kind of renown. 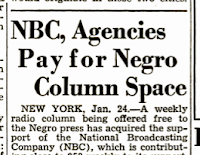 But Robinson was also writing for Jet Magazine and Ebony Magazine from 1953 to 1962. Born in New York, his most high profile writing appeared in the Chicago Defender and the Pittsburgh Courier Newspapers back to at least 1941. 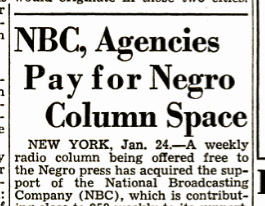 (These were both black-oriented papers of that era.) Robinson crossed color lines early. In 1948 he landed a weekly radio column with NBC. 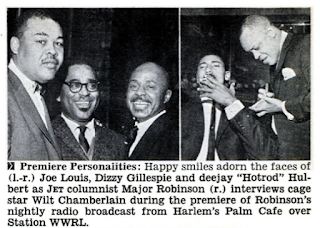 A Billboard article at the time noted that Robinson was already syndicated by Carter-Johnson to papers in 74 cities. Robinson continued to write for the Courier through at least 1967. But for the Courier he wrote mostly celebrity gossip. The Defender was real news. But he began diversifying his career before 1960. Sheldon Music signed him as a talent scout in 1958. In 1968 he was appointed director of Community Relations for Atlantic Records. That was probably his career peak. He became involved in politics in the 1970s. Robinson worked on U.S. Senator Jacob Javits’ [R] Advisory Citizens Comittee, and had was a PR advisor for Representative Adam Clayton Powell Jr. [D]. Robinson. He was still active in music as late as 1978, managing the Pilgrim Jubilee Singers. In 1981 he attended the Jack the Rapper convention in Atlanta listed by Billboard as working in Public Relations. When he died in 1988 at the age of 70, he was still working in PR, and still writing a column for the Amsterdam News.